lǎo wài (老外) is used by Chinese to refer to non-Chinese, in particular those who are not of Asian descent. It is rarely, if ever, used to refer to Japanese or Koreans. 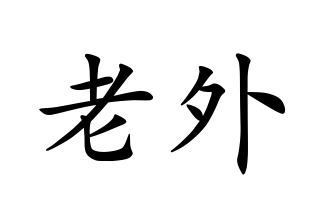 The character 老 means “old”, however it is also used as a prefix to indicate respect. Other words with this prefix include lǎo shī (teacher) lǎo pó (wife) lǎo gōng (husband) and lǎo bīng (veteran), to name a few. 外 means “outside”, and is shortened from the word for foreigner, wài guó rén. This entry was posted in Uncategorized and tagged word of the week. Bookmark the permalink.